While building a high growth SaaS business takes an immense amount of work and ingenuity, the concept around building a SaaS machine is quite simple. 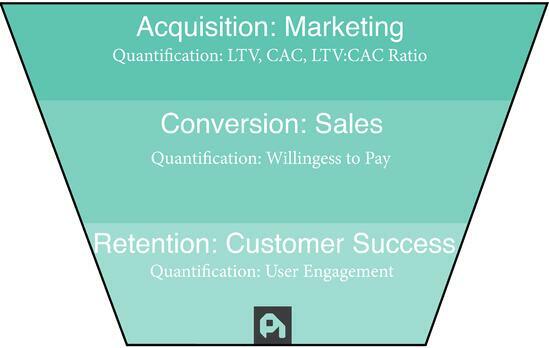 You acquire users, you monetize them, and you look to keep them around as much as possible. Yet, while each of these pillars represent an amazing opportunity for growth, all data indicates that we’ve become dangerously addicted to solely acquisition based growth. 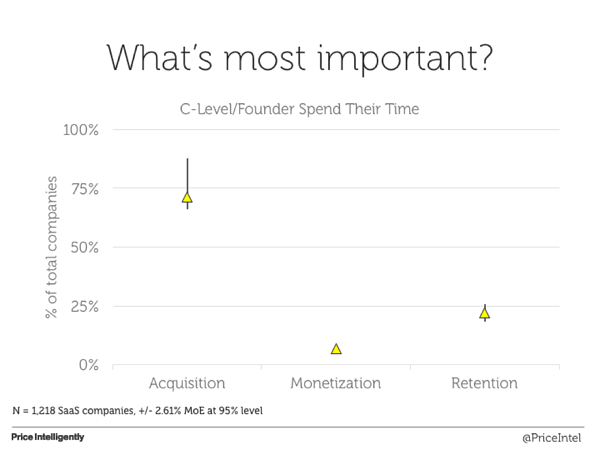 As you’ll see below, we’re barely even thinking about retention or monetization even though all data shows that these are much more efficient and effective at driving growth than acquisition. As SaaS competition for attention online continues to increase and the future of the capital markets comes more and more into question, weening ourselves off our focus on acquisition will become increasingly important. To put it more bluntly, if you continue to brute force your growth solely through acquisition, you will be left behind. In an effort to make sure you’re not left behind, let’s walk through just how addicted we are to acquisition before revealing why this is an enormous problem for your bottom line. Without customers none of us would be in business. That’s obvious. Yet, I don’t know if you realize just how much we’re all addicted to acquisition based growth. To study this phenomenon, the first data dive we did revolved around an anthropological study of blog posts. Why blog posts? Well, blog posts (especially in the growth ecosystem) are important cultural artifacts, because we write about what we know and we write about what gets us more attention. If we write a post about “The 4 Facebook growth hacks that increased our revenue by 1,729,239%” and we get a ton of traffic, then we’ll write similar content. As such we looked at 25,679 blog posts that were by definition focused on making you more money over the past few years and coded them as acquisition, monetization, or retention based growth advice. The results were pretty startling. 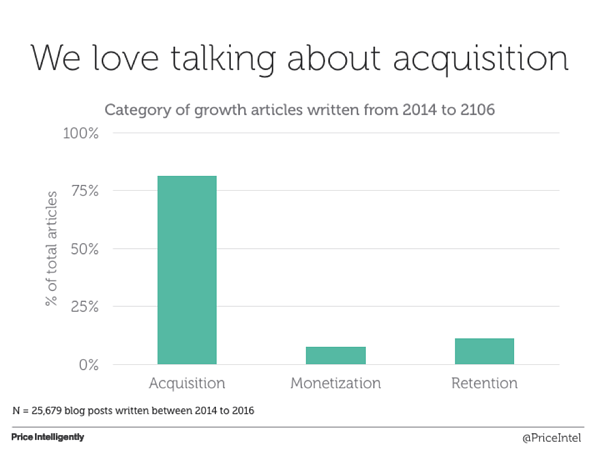 Just under 8 out of 10 growth blog posts are written about acquisition; only 1 out of 10 posts are written about retention based growth, and less than 1 out of 10 posts are written about monetization. The sad part is that the problem is getting worse over time. Our next data set focused on looking at the products we’re actually building in the B2B space. 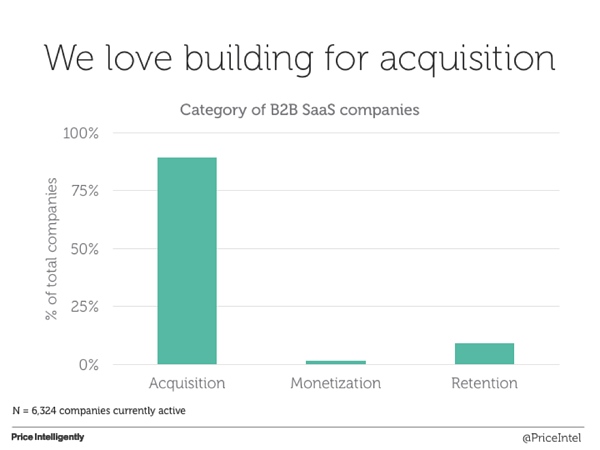 If we’re building a lot of products in the acquisition space (as opposed to the retention or monetization spaces), then presumably those products are getting attention, funding, and customers. As such, in a similar study, we looked at 6,324 B2B software companies and essentially found the same output as blog posts with the majority of companies focusing in on acquisition. 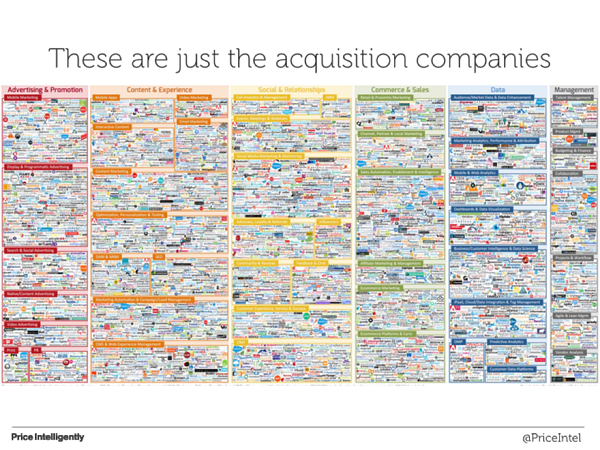 To give you just the sheer magnitude of acquisition focused products, here’s a good representation of most of those companies’ logos. Admittedly the above could be a chick or the egg problem, especially since a lot of those companies are likely writing content that obviously promotes their product in some way. Although that doesn’t necessarily refute our thesis, we wanted to come at this from a different angle, so we went straight to SaaS founders and executives to see if they were consciously buying into the above fervor. Unfortunately, we’re definitely all about acquisition. When asked to pick one goal between: 1. Getting more logos/customers, 2. Monetizing those customers better, or 3. 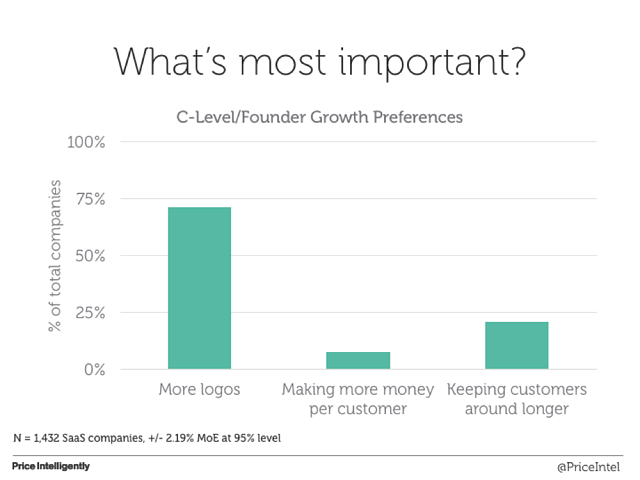 Keeping your customers longer; most of us focused on those logos. This wasn’t even a “false choice dilemma” for us, as a follow up question around “if you had 100 units of time, how would you distribute them across each of these pieces of your business?” revealed the same trend with most of us putting our eggs all in the acquisition basket. We spend more time on trying to acquire customers than anything else, and it's failing us. While we’d love to catalog and determine what caused this addiction (and we have a number of theories), the magnitude of this data indicates that somewhere along the way someone told us that acquisition was our oxygen. We just couldn’t live without putting all of our time and energy into acquiring customers. Yet, as we’ll see in the below data, acquisition is more like our crack, and as your parents told you growing up - don’t do drugs (or if you’re going to do drugs...for the love of God, don’t do crack). While CPCs, social presence, and content volume are all becoming more and more competitive, the underlying problem is that competition in our spaces is all becoming a dog fight, which makes switching costs that much lower for consumers. A decade ago in SaaS you could get away with a feature light product, and do phenomenally well. There just wasn’t anything else out there and the cost to create a company or a new feature was still high (although of course lower than the previous decade). Take something like CrazyEgg for example (web and content behavior analytics), one of the darlings of the first wave of SaaS. When the product came onto the scene, there was nothing else like it in marketing technology, or at least nothing at the relatively low price point. Competition wasn’t fierce and the rate of innovation was much lower, because people were extremely happy to have access to something they never had before. Although I haven’t asked him specifically, I’m confident Hiten would admit that the first iterations of the product by today’s standards would be so simplistic that CrazyEgg 2005 wouldn’t be able to compete at all with CrazyEgg 2015, HotJar, Full Story, and the now dozens of other behavior tracking products. Of course, development of a space is inevitable, but the rate of development has increased rapidly with the introduction of infrastructure and platform products. Now if we wanted to start a new product, we could have everything up and running with an MVP deployed to beta customers literally in 24 hours. In fact, in the two years we’ve been building ProfitWell (SaaS financial metrics), 28 different “SaaS Financial Analytics” products have hit the market. Market data supports this, as well. 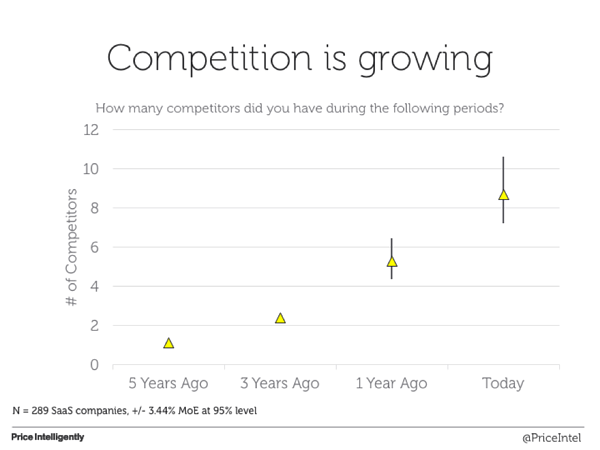 Here’s a look into the rapid concentration of competition across 289 SaaS companies. Notice how the rate increases in the last couple of years. A product of this competitive phenomenon is that the value of individual features and even core features is becoming less and less. Just heatmaps is no longer enough to keep people around, because they can presumably get this anywhere through a number of products. Even if the quality is very different, the presumed ability to access these features is enough to drive prices down. Further, even five years ago features like different data integrations, analytics, support, and single sign on could be ways to steal customers from your competition. Sales pitches were designed around competitively selling feature gaps. Marketo for instance would latch onto HubSpot’s lack of “enterprise friendly” features to steal large companies that “graduated” from HubSpot. Yet, the rapidity of producing features has destroyed the ability for these features to be moats to competition or even a way to boost monetization. In the below, we mined data over the past four years of different core features, as well as these add-ons, normalizing them across companies. 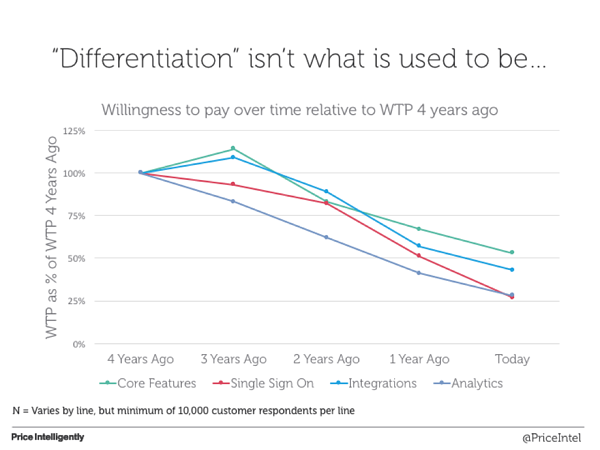 You’ll notice that while the diminishing value of core features isn’t as rapid as the diminishing value of data integrations, the trend is still pretty clear. The nail in the coffin here is that the prevalence of competition and the rapidity in producing product has made acquisition so much harder that the effectiveness of focusing on that lever solely has diminished considerably. To put it another way, because it’s continuing to become easier to switch from product to product and the increase of ad, content, and social noise has gone up, it’s not only harder to acquire a customer, it’s also harder to keep them. Yet, just focusing on acquisition means your bucket becomes so leaky, all you can do is add more customers to the top of the funnel in the hopes that you’ll make up for all those you're losing. To quantify this a bit more, we built what’s called a simultaneous equations model to normalize and compare the impact of doing one unit of effort on each respective pillar and seeing what that unit of effort’s impact on that pillar. Put another way (although it’s a bit oversimplifying), we basically looked at if you spent an hour of time on each of the three pillars, what would be the relative impact on that hour of time to your bottom line. What we found is that if you improve your acquisition by 1% (by increasing your lead volume or conversion rate), you’ll see just over a 3% boost in your bottom line. This contrasts starkly with the relative improvements in monetization (increasing your ARPU by 1%) and retention (lowering your gross churn by 1%) that see boost in roughly 13% and 7% respectively. 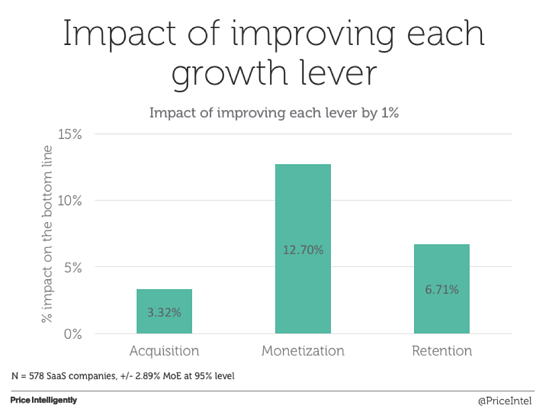 The individual numbers aren’t as important as the relationship that shows improving your retention or monetization has 2-4x the impact as improving your acquisition. Yet, all we want to focus on is acquisition, and to make matters worse, data indicates that this trend is getting worse over time. Where do we go from here? It starts with you. Fixing this isn’t exactly simple. Your company’s entire DNA is likely way too focused on the wrong place of optimization (or rather the least effective lever of optimization). Without sounding too cliche though, fixing this really starts with you. No matter your level, from CEO to entry level kid right out of college, understanding where to prioritize your time, experiments, and resources is absolutely paramount. Customer acquisition is and always will be important, but table stakes has moved beyond just having a good marketing team, now product marketing and product in general are absolutely crucial to success. Getting your SaaS pricing strategy on track for growth with value based pricing.